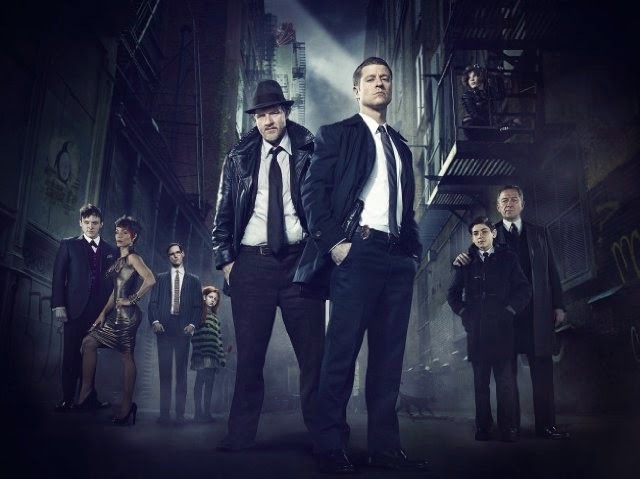 Well it took seven months--but only about three weeks of binge watching--to catch up with GOTHAM. That's 18 episodes if you're keeping score at home. Eighteen pretty darn entertaining hours, I have to say. First things first: the MVP of GOTHAM is the person in charge of casting. Not sure who that is, but he/she deserves a medal. Or a raise. I have loved getting to see new spins on classic characters with new actors. Benjamin McKenzie as James Gordon is wonderful. McKenzie’s portrayal of Gordon’s goodness tinged with anguish over things he has to do is wonderful. He, along with most of the other, are actors of whom I was unfamiliar before GOTHAM so I’m coming with a blank slate. Donal Logue’s Harvey Bullock, Gordon’s partner, is also good if not a little over-the-top in a more typical partnery kind of way. I’ve enjoyed the progression of Bullock into a true partner even if he didn’t agree or know where Gordon was heading. David Mazouz plays young Bruce Wayne and he got my vote in the opening scene when, for the first time on film, he screamed after his parents were murdered. I mean screamed. Since then, he’s turned into a stoic lad who wants to know more but is only hampered by his age. But he can sure boss Alfred around. Sean Pertwee is an actor I knew but only from ELEMENTARY. Here, he’s a badass Alfred and he is great. I love the little subtle touches he gives to prove he’s scared to death at the prospect of raising a young, rich orphan. But this Alfred has some military background and that’s starting to come out. As for the villains, I like that Edward Nygma (Cory Michael Smith) works for the cops. Smith plays the future Riddler as a weirdo that wants to fit in but that no one likes. John Doman as Carmine Falcone conveys such gravitas that he fills the screen with his personality. I think that the choices Jada Pinkett Smith is making are fun in a comic-booky sort of way, but she still has the presence to make her scary. Above all other villains is Robin Lord Taylor’s Penguin. Oh my! He is my MVP of the entire show. I love the way he’s portrayed as a thinker, a pipsqueak who is not above getting knocked around because he’s thinking five steps ahead. Ten even. I’ve liked the Penguin in the comics because he’s a lot like Marvel’s Kingpin or even Moriarty: he’s a puppeteer who pulls a lot of strings but not ones that can be tied directly to him. Burgess Meredith was great for what he did but Danny DeVito’s version was a little off for me. Now, typically, Oswald Cobblepot is a rich orphan, one on par with Bruce Wayne, but not in GOTHAM. Here, he’s a low minion who has worked his way up the crime ladder and looks to rule the city. Taylor’s characterization of Penguin is shocking (he’ll out and out stab a guy with little thought) and funny, often in the same scene. The stories are good and fun, successfully bridging the line between police procedural and comic book hijinks. We get disturbing storylines as early as episode 2 (with the abduction of children for a fate not named but implied) that are followed soon by ones featuring a guy who ties his victims to weather balloons and let’s’em rise...then fall. There are long-running story arcs--Gordon’s odyssey as a good man in a bad town is the prime one--but the Penguin’s is one of the better ones. He loves Gotham and will do anything for her, and it’s interesting to see how that plays out episode after episode. I like that the writers are presenting characters wearing masks--goat mask, red hood--before Batman or other masked villains that we know show up. It’s neat to see them put forth the idea of the power behind a mask. It’s also fun to see nascent versions of the characters we already know. It’s not all wine and roses, however. That very thing of showing early versions of the characters can be too much. The young Poison Ivy I’m not fond of much (and it was hard to find a good image to use today and not have her in it). She’s just a street urchin out of Oliver Twist. Young Bruce Wayne comes off a little too much like the current Bat-God--the modern version of Batman where he’s thought out every last thing to the nth degree that you can never beat him--and he still needs to be a kid. That’s why I like what they’ve done with Selena Kyle (Catwoman) and how the two of them get along. There are a few little things but not too much to make me not like the show. I even watched 3-4 episodes on some days. It sucked me in and I enjoyed them all. Like I wrote last fall, I still would have liked to have seen Thomas and Martha Wayne on screen for awhile and I'd love to have seen GOTHAM become the universe where Batman doesn't have to exist. The reason I haven’t watched until now is the time it airs: 7pm on Mondays. That’s family/homework time. CASTLE airs at 9pm on Mondays and I don’t have the time on Mondays to tape-and-watch. But I will definitely start now. I’m just happy to have a new Batman show on TV with interesting twists on the known canon. Next up: catching up on The Flash. So, GOTHAM watchers: what say ye? Like the show? Dislike the show? Castle and Gotham are both on my list.